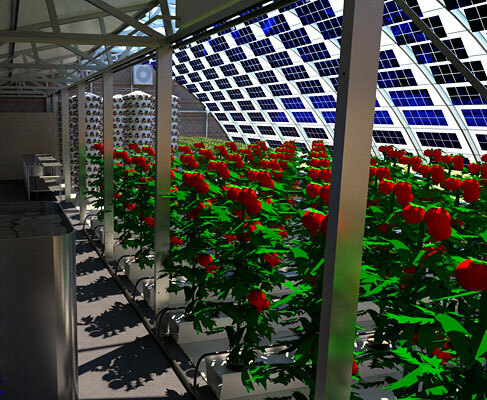 To be used in urban farming situations utilizing an existing nutrient cycle. 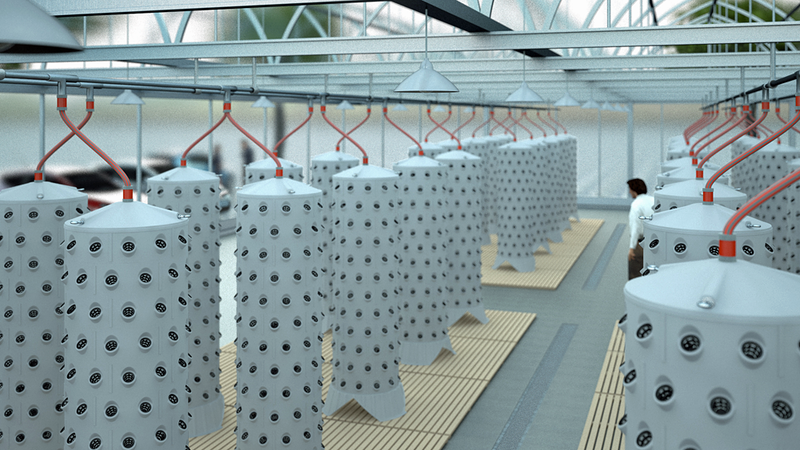 Example: In 1 squaremeter with 2,30 meters of vertical space the barrel provides 144 individual growspaces. The aponix barrel is meant to be integrated into an existing circulation system or facility as a growing component like an NFT – but in a much more versatile and flexible way! In the following we describe the required prerequisites to integrate one or more aponix barrels into an existing circulation system. You might also want to check out the key features of the aponix platform. … you can use an existing nutrient cycle either using hydroponics (with mineral fertilizer) or aquaponics (using organic fertilizer from fish). … you will need a pump (with or without pressure) to power the included irrigation (spray nozzle for aeroponics, sprinkler or for low pressure use our top water buffer for vertical drip irrigation) to deliver nutrient solution to the roots of your plants. … you will need a suitable lighting situation for your plants to thrive either using natural sunlight from a greenhouse or artificial plant lighting. We assume, you know what exactly your plants need. … please make also sure that all other surrounding conditions for optimal plant growth are adequate. Depending on your crop – air flow root temperature, availability of CO2, sufficient aeration in your liquid, shading if necessary and protection from pest etc. … you will need to do the plumbing yourself or with the help of a local expert or experienced grower to return the liquid to your cycle. Usually liquid drains at the bottom of your barrels and needs to be diverted to your sump tank or reservoir preferably just by using gravity. Sometimes it might also be useful if you an put pipes or reservoir under the ground level. The aponix barrel can be utilized as planting equipment to set up many grow spaces quickly in an existing circulation system. 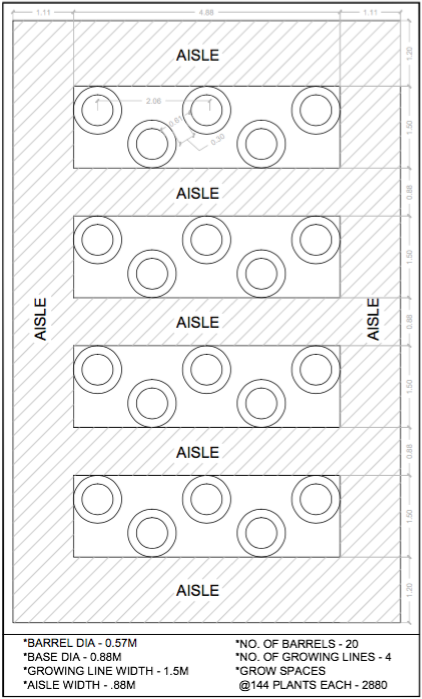 The example setup below with its 1m wide aisles provides an average of >60 plants per sqm! This sketch is the basis for this rendering. Multiple vertical barrels arranged in rows and on ‘islands’ to gravity feed the liquid back to a central reservoir. Facility design depends very much on the individual circumstances and preconditions of the site. 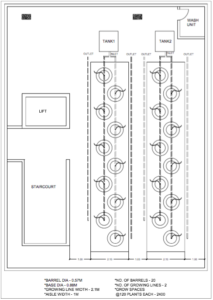 We recommend you also talk to an experienced planning expert to get the details right to integrate our vertical grow space solution smoothly into a larger successful production facility. We left a space of 1m from the glass all around the production. The orange areas are the main production lines where the barrels are set up. On the bottom right we see the more detailed view of a orange area. The yellow lines represent the gutter or liquid lines back to the reservoir. The liquid exiting the barrels on the bottom just falls into the gutter and travels back by gravity using a slope of 1-2%. The idea is to be able to change the distance of the barrels between each other any time it is necessary, increasing or decreasing the density of barrels. 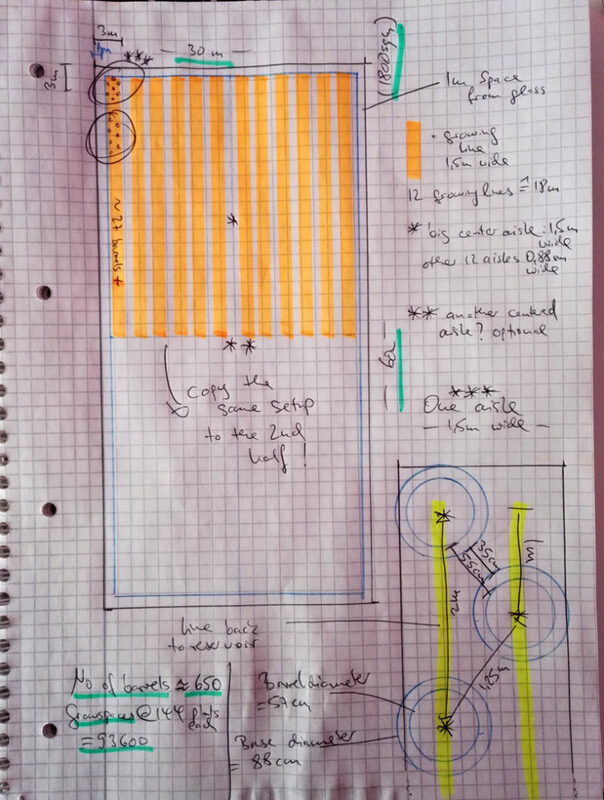 As a result we have +27 barrels for a production line that runs half through the greenhouse (+54 barrels along the whole 58m long, 1,5m wide line), assuming we would have a larger center pathway in between the 2 blocks. You find more detailes metrics in handwriting on the sketch. We also assumed, that this greenhouse is only used for the cultivation of plants and that packaging, cooling, storage, reservoir etc is located somewhere else. b) the height of the barrels which we assumed 12 ring segments (each 15cm high plus 25cm for lid and base combined) by just adding more ring segments resulting in higher barrels. The area would host ~650 barrels holding 93600 grow spaces using 12 ring segments (=144 grow spaces) per barrel. The versatility of the aponix platform can be seen from this special setup. It can be used with any number of vertical barrels as long as the ones grown crop are connected to the other ‘active’ vertical barrels. As base we use multiple interconnected standalone barrel setups. The closed standing bases are all interconnected with a 3/4-inch hose. Each base is equipped with two valves that can connect them with other closed bases via hose (see ‘option 2’ on the sketch below). To disconnect the operator just closes the valve and disconnects the hose. 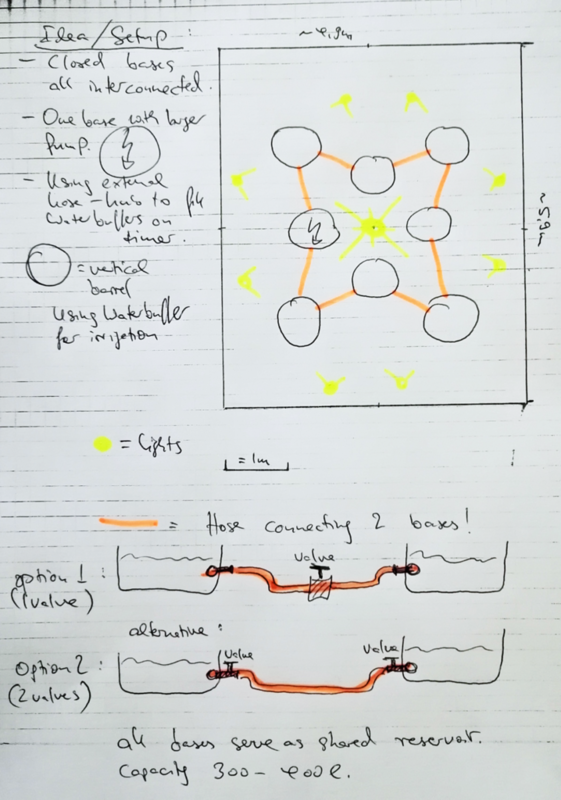 Connected closed bases as ‘one’ reservoir, avoiding to use an external reservoir and ensure liquid flow and distribution between the individual vertical barrels. Example setup for a small urban farm. This is just the cultivation area. 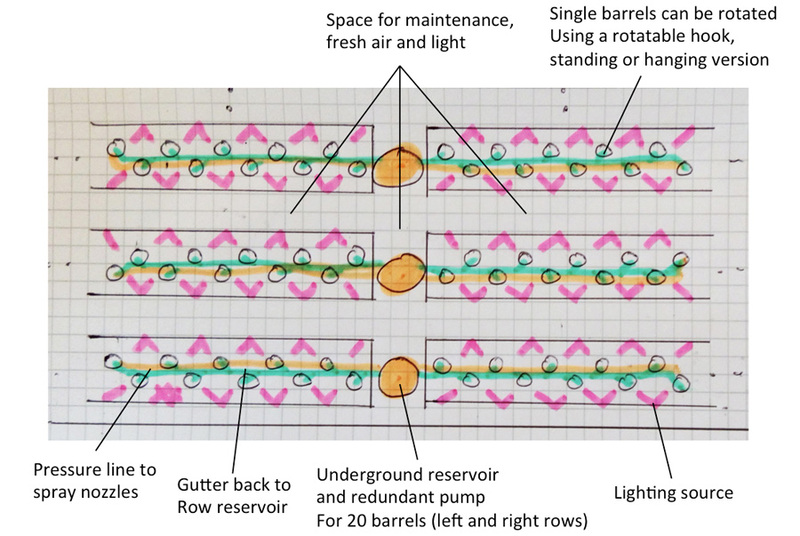 Urban farm setup for 20 vertical barrels with 2 independent nutrient lines.